Litter Cleaning Robot - Cats are being spoiled now more than ever! Litter Cleaning Robot. It’s nice to see the wonders of robotic technology extending into the realms of our furry friends—even if this realm is their toilet. Since the first automatic, self-cleaning litter box came out on the market years ago, cat lovers have breathed huge sighs of relief—finally a roboticist who owns cats! Since then, days of gritty, manual scooping and dealing with unsavory smells have gone out with the trash for many cat owners. As opposed to the rather nasty task of manual waste removal, these self-cleaning litter boxes employ a robotic mechanism that cleans the waste on their own. Some popular models on the market include the PetSafe Simply Clean automatic litter box has no exposed moving parts, which makes it safe for all pets in the house. It quietly cleans itself by rotation every month, requires no special bags or waste receptacles. It uses ordinary clumping litter. The Litter Robot litter cleaning robot, which is one of the priciest automatic litter boxes at about $300. This model cleans itself using a rolling action that "breads" the clumps with litter during the cleaning cycle. The waste is then deposited in a receptacle drawer, which you can line with any plastic bag to later dispose of. The LitterMaid litter cleaning robot has a variety of different models: one offers carbon-filtered air cleaners to further reduce odor in homes. The Litter Maid is one the most popular ones due to its affordability. Also, you can use ordinary clumping litter, but you'll need to buy the disposable waste receptacles. 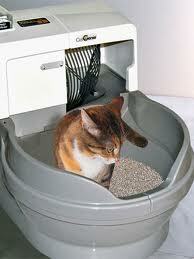 The CatGenie kitty litter box works like a toilet, using ordinary water to flush itself. 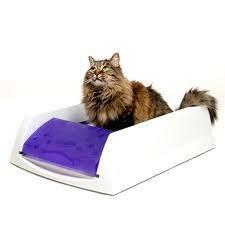 It automatically sanitizes itself and the litter box remains dust free. The ScoopFree Ultra cat litter cleaning robot is similar to the Litter Maid, but uses Fresh Step Crystals litter in its disposable tray. 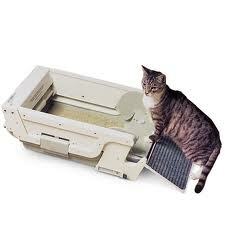 The unit itself is affordable, but the purchase of litter tray refills could make maintenance pricey in the long run. Click HERE to learn more about the ScoopFree litter cleaning robot. Still, these cunning machines have arguably a few minor setbacks. Price is an issue for many, especially with the Robot Litter and the accumulated cost of buying disposable waste receptacles for the other models. These modern devices may also require some getting used to. As most cats believe they’re the Pharaoh of Egypt and will not take to intrusions—especially the weird looking, robotic kind—that easily. 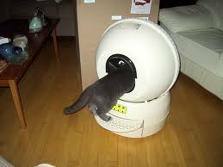 Buyers of the older models, like Litter Maid, have also complained of the noise their machines generate, their bulkiness, and sometimes messiness. Pet care companies continue to improve models though, as demand for the ultimate efficient and affordable self-cleaning litter box will always be there. As Scoop Free inventor Alan Cook said of his product’s origin after cleaning out kitty litter that had been unattended for days, “I was thoroughly disgusted by the experience, and I started muttering, ‘If we can put people on the moon, you'd think this thing could clean itself!’” Well, now they do. Of course cat owners are enthusiastic, including myself, since these nifty machines had come out. I own the PetSave and it does all my dirty work for me, so now I can devote myself to more fulfilling tasks, like allowing my kitty to use my stomach as a soft pillow for her daily naps. Although I love my cat tremendously, before I purchased my robotic kitty litter box, I would put off cleaning her nasty potty box for days and when the smell was particularly strong I was tempted to throw out Hollie along with her accumulated offenses. Just kidding. And if you’re still not completely satisfied with a robotic kitty litter box cleaner, then you should get yourself a robot cat such as Segatoys “Dream Cat Smile” from Japan—absolutely no scooping necessary!